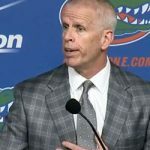 If you did not know entering Monday’s three-headed press conference with Florida Gators president Bernie Machen, athletic director Jeremy Foley and head football coach Will Muschamp that the purpose of the event was to discuss the dismissal of the third man on that list, you might have thought it was held to explain why Muschamp was receiving a raise and contract extension. Over approximately 45 minutes inside the Florida football facility, Machen and Foley sung Muschamp’s praises. When Muschamp got to the podium, he shared similar sentiments about his employers and the program he was leaving behind. “From my perspective as president, I have treasured – literally treasured – the last four years in working with Will. He was asked to come here and build a program, a program built on character and good academic values, and he was asked to develop young men that would be a credit to the Gator Nation. He has done that,” said Machen. Foley admitted it was hard to follow Machen’s comments because it is how everyone within the Gators program feels about Muschamp. Though Foley still to this day believes that Muschamp is a good football coach, it is obvious that things did not go the way that either he or Muschamp expected when he took over the program. Foley sees Muschamp as a great friend but not the right fit for Florida anymore. It was an emotional moment when the decision had to be made Saturday night and related to Muschamp on Sunday, but Foley had no choice and Muschamp handled it with class. “He’s a very good football coach. He has a track record. He’s won a lot of championships in his career, and he’ll win more, I promise you of that. It just was not working here as we all envisioned and certainly not as he envisioned four years ago when he came on board. And when things are not working, sometimes you got to make a difficult decision despite the tremendous effort he put in,” Foley continued. Muschamp joked about being “under-dressed for the occasion” when he took the podium in a Florida jacket as opposed to the suits donned by his school’s president and athletic director. Once the levity settled, Muschamp got down to business discussing his dismissal. “I want to thank Jeremy and Dr. Machen for their support here at Florida; it’s been outstanding. I stand by my statement [Sunday] and that’s that we didn’t win enough football games. That’s the bottom line, you got to win games. We didn’t get that done. Very disappointed and frustrated that did not happen. Certainly had our opportunities, especially this year keeping a healthy roster and having opportunities to win football games, we didn’t get it done. Certainly Saturday was a great example of that,” he began. When the topic switched back to his dismissal, Muschamp eased right back in, offering nothing but praise for his administrators, players and the university as a whole. Muschamp admitted that there are plenty of things he would do over again, though he noted that those decisions have to be looked at in the proper context of the situation because hindsight is always 20-20. “It’s frustrating to see guys stand in this day and say, ‘I wouldn’t have changed anything.’ Well hell, you would’ve gotten fired again,” he said. Muschamp also said it was hard to address the team before noting that he – a Gainesville, Florida native – will always be a Gators fan. “You spend a lot of time with these guys and they’ve done everything I’ve asked them to do on and off the field. I’m going to root for these guys as hard as anybody. I want the University of Florida to be successful. I’ll always be a Gator…unless I’m on the other sideline. Someone who has constantly preached hard work and effort to his players, Muschamp explained that used his firing as a life example when he met with the Gators on Sunday afternoon. “You can work really hard and you can be really diligent in what you do, but you got to have results in life. Whether you’re in the business world or whether you’re in the coaching profession, it doesn’t matter. You got to produce,” he said. “It’s kind of like players tell me all the time, ‘Well, I’m trying hard.’ ‘Well, I know, but you’re not producing, so we got to go with somebody else.’ That’s kind of the message I had for them. Let’s learn a lesson from it and understand that you got to produce in life. Muschamp will be coaching the Gators for two more weeks, an opportunity he deserves and asked for during his meeting with Foley on Sunday. Though he will not coach Florida if it advances to a bowl game, Muschamp has Foley’s full confidence over the remaining two weeks of the season. “That’s the last thing I’m worried about. You talk about a pro, a guy that’s all about the right things. If he didn’t think he could do it, he would have said, ‘I’m not gonna do it,'” explained Foley. 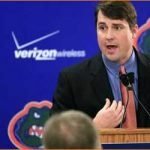 Muschamp’s contract will be honored with the coach set to earn $6.3 million over the next three seasons, paid in even installments over the years remaining on his deal. He will take plenty of money from his split with Florida, but Muschamp will also value one friendship in particular that he made at UF. I wish we could just demote him to Defensive Coordinator, that way at least they would get something for the money and he is a good DC, esp. if Foley and Machen love him that much. Let’s hope he makes a huge donation ($6.3 million??) to the Gator Athletic fund. Seriously though, I guess that’s why he is still smiling. Talk about a golden parachute. Even were he to be retained as DC, I don’t think he would work for free, therefore he would get the payout and a salary. Many payouts however tend to be contingent on if you get a job then it goes away or at least the difference in what you are making vs. what your payout is. That’s not the way it works. He wouldn’t be working for free. He’d be working under the original contract which paid him to coach. He would just be a very high paid DC. someone give me $6M to not work and I’ll be the happiest, classiest guy ever. Bingo Scroud! Demote him to DC and let him earn the 6.3M. We’ll see how long this mutual love affair lasts. Muschamp should feel blessed to have been given the opportunity, then have the opportunity extended beyond reason, then receive 6.3M as a parting gift. I’d love Foley too. You don’t do that. You never have two bosses. If a player has a problem, does he go to his head coach or the guy who brought him in? Muschamp’s history, and it’s well deserved. The rest of the staff is gone too. It’s just nonsense that the assistants will be recruiting as well. They are going to be looking for a new gig. They can’t count on the new coach wanting to keep any of them. Don’t forget that Roper and Summers get paid as well, they were’nt stupid enough to come to Florida without a guaranteed multi-year deal with Muschamp on the hot seat. Sounded very classy. He also appears like a weight has been lifted off of him now. He seems happy now too. Then again, hell if I was going to make 6.3 million over the ext 3 years from UF while being the DC at Auburn next year I would be smiling too. Best of luck (except against us). Bet Foley feels foolish with that extension given up in year 2, cost UF millions. That picture!…I can’t remember EVER seeing him smile like that…even after a win…so the cynic in me says he has $6.3 million reasons to smile. Really bummed to see Champ go. He’s definitely one of the most likeable and down to earth coaches out there, as well as just a good person and leader of men. The situation just feels like Muschamp got called up too early, and perhaps needed to take some lumps at a smaller school before the bright lights of Florida. 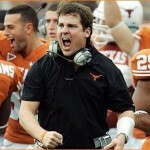 I’m pretty confident he’ll learn from his errors and go on to be a heck of a head coach one day. Nice to see ol’ crazy eyes smiling for a change. $7 mill will do that to a man. Must be awesome to be one of Foley’s boys. On the other hand, if you’re not one of his boys, then you don’t even get considered, regardless of your qualifications . . . and what’s best for Gator Nation be damned. The man has too much autonomy. For the ones attributing his demeanor to his financial situation, yes, he doesn’t have to worry about providing for Carol and the boys. But I think your cynicism blinds you to the man’s character. Money can’t ultimately satisfy. 6.3 million comes with its own challenges. Will Muschamp probably will put his head on his pillow and sleep quite well. Not because of 6.3 million, but because he’s a real man blessed with the outward gift of a great marriage and family and the inner gift of class and integrity. Living without regrets is its own best reward. Honestly, I seriously think he’s QUITE relieved to not have to endure the criticism and offensive charactures put forth by so many. Question the offensive production, but not his character. HE. IS. NOT. A. CHUMP. His name is Will Muschamp and I’m proud to have supported him from Day One. I haven’t read that any person wants anything but the best for Will Muschamp and his family. I have said that all along. Just because a guy isn’t the right guy for a job doesn’t make him a villain. It’s not personal, just business. I for one wish him and his family all the blessings in the world. He’s certainly off to a good start financially. It’s okay to say that, right? Most of us don’t have quite as soft a place to land if we get fired. Good for him. I don’t think anybody should questions Will’s effort and he certainly cleaned up all of the off the field BS that littered our program under the Coach Up North There. I am sure he wil have plenty of opputtunities to be DC at a major institution; and he will be an HC again shortly thereafter. Foley truly believed in Will and at the very least the next guy will know he will get the same support. SW FL Joe, you nailed it. sjlkoepp I agree wholeheartedly with your statements. You can tell the players just love him too. With some of you, this guy can’t win. Take the picture in the context of when it was taken and what he was being asked. Yeah, he will get paid, but there isn’t a true coach out there ( well, maybe Charlie Weis) who would trade the opportunity to still be coaching and be success for that buyout. Will Muschamp is a classy coach and dang good coach. Things did not work out and he realizes that. Tell me when you’ve ever seen a classy press conference like that from a guy who lost his job. I will always support that guy in spite of.